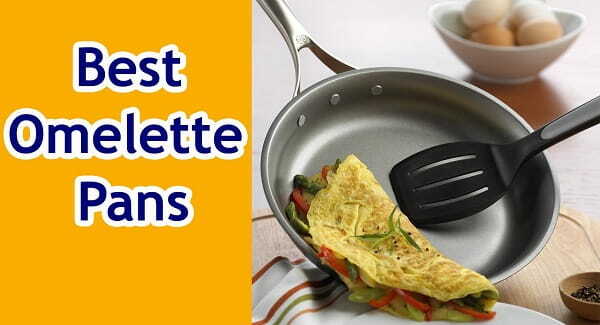 We specialize in reviewing the latest in cookware. 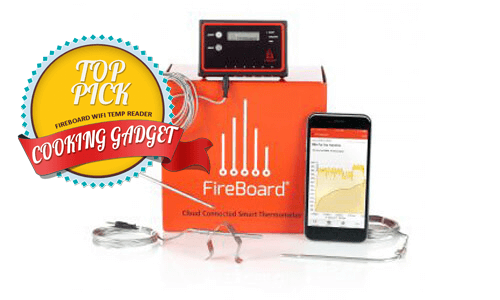 With a small team dedicated to researching appliances, cookware, and tech gadgets. Imagine starting your day, or relaxing in the evening, without a nice cup of tea. We can’t either. A piping hot kettle full of delicious English breakfast tea or soothing green tea serves as the perfect bookend for any day’s activities, and also brings a variety of benefits with it. 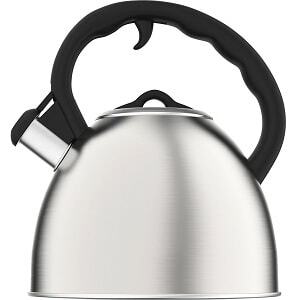 Making a good cup of tea, of course, requires boiling a pot of water – and while those instant electric tea kettles sure are convenient, they aren’t nearly as fun or as calming a ritual as a true whistling tea kettle. They’re simple and easy to use, nearly indestructible, and conveniently let you know when the water is boiling and ready to pour over a bag of your favorite tea. 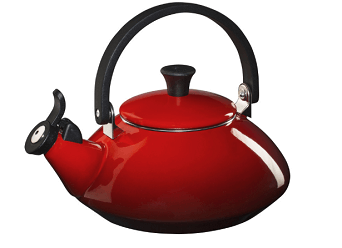 This guide has all the info you need to know to find the right tea kettle for your purposes, as well as a quick roundup and reviews of the best whistling tea kettles available in 2019. Keep reading to find the one you like most. Here’s a quick overview of the winners we cover. Click pricing to check the lowest price at Amazon or click the product name for a quick scroll down to our review of the product. 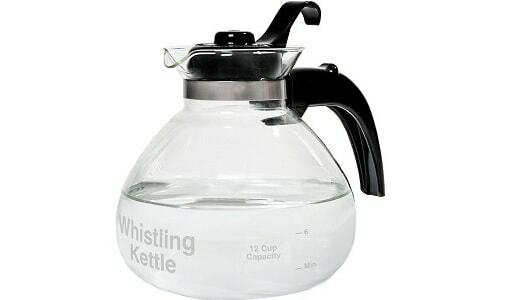 Why Get a Whistling Tea Kettle? Is there any reason to opt for a stovetop tea kettle over an electric one? First, they can be cheaper. Second, they are a lot more durable – nearly indestructible even, made of heavy-duty metal that can be dropped and banged without sustaining too much damage. And since they’re usually made of stainless steel or similar, they’re also pretty easy to clean. That’s not to say there is anything wrong with an electric tea kettle. It’s the classic ritual and routine of stovetop models that keep us coming back. Choosing a good tea kettle should be pretty easy, but as always, there’s a few things you want to keep an eye out for to make it does what you need it to do. How Fast Does It Boil Water? This should be one of your main concerns. A high-qaulity, thick kettle is nice, but if it takes forever to boil water, what good does it do? Does The Handle Stay Cool? The last thing you want is to reach for your boiling kettle on the stove, and find that the handle is as hot as the water. That’s painful, dangerous, and an easy way to ruin your morning. Pay attention to the spout cap, too; if it gets hot, you may not be able to open it. Is The Whistle Loud Enough? Cheap whistles are weak and quiet. Good whistles are loud and clear, allowing you to hear the water boiling from the other side of the house. Lesser-quality kettles tend to rust, even after just a few uses. Better ones will last years and hundreds to thousands of uses before rust becomes problem, ensuring you don’t need to replace it – and aren’t consuming tons of unpleasant rust. Do You Require a Built-in Infuser? Some whistling tea kettles have smaller tea infuser. It holds tea in the water and easily lifts off the water after a certain time period. Some tea kettles have a well fitted tea infuser which works well with kettle. With simple design, stovetop kettles are often used by many people. These kettles may be whimsical or compact. Glass kettles are cheap and easy, and sometimes even dishwasher safe.But they aren’t great options for putting on the stove; Glass is too fragile and not appropriate for direct, high heat. Look for something else. Cast-Iron kettles are some of the cheapest, as well as the most durable. Cast iron is thick and heavy, but this makes it an excellent conductor of heat. It’s alsoheavy to carry around, and rusts quickly; you’d need to get all the water out and dry it off after every use to prevent it from rusting. To prevent this, they may come with enamel or other finishes. Copper is a good option for tea kettles as it conducts heat well and heats up quickly. It’s very shiny and looks great. However, it’s not the most durable material, and tarnishes quickly. Aluminum kettles are light and cheap, making them excellent options when you don’t want a hefty or expensive piece of equipment (like a cast-iron kettle). The downside is that they aren’t very durable and can be dented, scratched and tarnished. Stainless Steel is generally an excellent material. It’s durable, conducts heat well, doesn’t dent or scratch, doesn’t rust, and is very easy to clean when you (occasionally) need to. It also comes in all sorts of cool finishes that can add some flair to your kitchen setup. Other things to look for might include a wide lid, which makes them easier to fill and to clean; a gooseneck spout, which gives more control when pouring (useful for the coffee lovers among us who like a good pour-over and want our tea kettle to double for that too); and a heat-resistant handle. 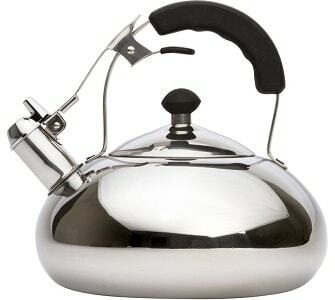 Metal handles can get quite hot very quickly, making it difficult or even dangerous to grab the tea pot. Of course, don’t forget a whistle when choosing your whistling tea kettle. On vintage whistling tea kettle, this is nothing more than a small opening in the lid of the spout, causing the jet of steam to build up pressure and make noise as it exits the spout. Sometimes, classic is the best. 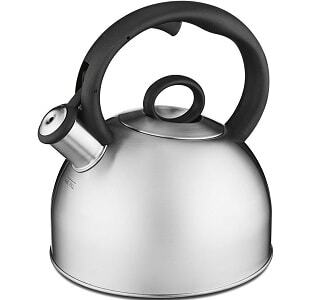 The Oxo Good Grips Classic Tea Kettle is as simple as it gets, made from a smooth, polished stainless steel that is strong, durable and protects against rust. 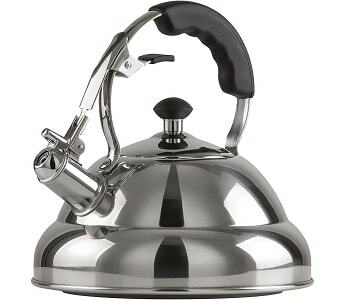 If simplicity and durability matter to you, this the tea kettle you want in your kitchen. The non-slip silicone handles are heat-resistant for safe handling. The handle also rotates out of the way to make filling and cleaning the pot easier. The large lid makes filling the pot – as well as cleaning it – easy. The wide stainless-steel bottom heats quickly and evenly. The spout cap has a extra loud whistle for alerting you to boiling water. While we didn’t notice any signs of rusting over 30 days, we did see complaints online of the kettle rusting. Despite being made of stainless steel, some owners have found that leaving water in the pot isn’t a good idea. The inside isn’t polished – though we’re not sure why you’d want that anyway. Le Creuset is well-known for making some of the finest kitchenware you can get your hands on, and their Zen Kettle is no different. It’s more expensive than many choices of tea kettle, but worth every penny thanks to its high-end construction and classically-stylish good looks. It’s made from hardened heavy-gauge carbon steel, with an enamel coating. This means it’s the perfect combo of durability and style, with a smooth, attractive surface and construction built for a lifetime. The ergonomic loop handle gives a secure grip and is heat-resistant, so you won’t burn your hands reaching for the water on the stove. The round lid on top has a stay-cool phenolic knob, which doesn’t conduct heat. It’s not the widest lid but is wide enough for most uses. It’s compatible with all heating methods – even induction. Use it to make a good cup of tea anytime, almost anywhere. Water boils kind of slowly.The steel is very thick, which means it heats evenly and retains that heat, but takes a while to heat up fully. The enamel sometimes chips and flakes. This can be a problem when it happens on the inside of the kettle. It’s kind of heavy. This may or may not be an issue. The Willow and Everett kettle is perhaps one of the nicest on our list, and one of the largest. It also looks good, made from polished, surgical-grade stainless steel, and moderately-priced. The surgical-grade stainless steel is smooth, shiny and robust. It holds up well against dents, rust and corrosion, scratches, and more. A stainless-steel infuser in included, making it easier to brew a cup of custom tea. This infuser strainer allows you to make cups of tea using loose-leaf and other types of tea – not just tea bags. It has a special bottom surface, composed of 5 layers of stainless steel, iron and aluminum. This tri-material surface makes it a better, more consistent conductor of heat (it also means it takes longer). The whistle is loud. Very loud. You’ll always know when your water is boiling, immediately. The handle and spout lever have a non-slip silicone coating. They also don’t conduct heat, for easy grabbing. The lid tends to rust. Surprising, given the stainless-steel build, but apparently nothing is immune. It can take a long time for the water to boil. This can be attributed to the thick bottom, composed of so many layers. Compact and stylish, this tea kettle from Circulon doesn’t look like it can hold much water, but somehow fits room for 1.5 quarts of water in there;that’s more than 6 cups. The kettle is relatively inexpensive and durable, too. The solid steel build with enamel coating is durable and relatively lightweight. It weighs only 2.35 pounds and is easy to pick up and move, even when full. The whistle is loud. You can’t miss it, anywhere in the house. The enamel coating is excellent for repelling stains and is easy to clean. This alsoadds to the elegant good looks. Style is a selling point for this one, too. It’s affordable. Always a nice thing for any tea kettle. The spout has been shown to be damaged over high heat. This is due to the kettle’s relatively small size; the heat from a large burner goes around the sides and hits the spout. This can affect the handle too, and it can get hot over high heat. Water dribbles out of the spout.If you overfill it, or pour too fast, you may have some problems. It’s hard to fill properly. The interior of the kettle is dark and can be hard to see exactly how full it is. Classic and cheap. This 12-cup kettle has ample room to make hot beverage along with borosilicate, shock-resistant glass material. If you’re a fan of old-school diners, where they pour you a cup of coffee out of simple glass carafes, but are more a fan of tea, the Medelco Café Brew is an excellent way to boil a couple cups of tea. It’s inexpensive. That’s always a nice plus. The heat- and shock-resistant borosilicate glass body is durable, and it’s cool to be able to see right into the pot to tell how much water is in there. The glass is made in Germany and the entire kettle is assembled in the US. It comes with a metal heat diffuser, which allows it to be used on electric stoves. It’s dishwasher safe and easy to clean. The glass build is light. Lifting and moving it is super easy. You need to be very careful so as not to break it. Never place the hot kettle on a cold surface or in cold water, don’t brew tea directly in it, and don’t heat it over high heat. These rules limit what you can do with it. The whistle is very quiet. You might not hear it from another room. It only holds 6 cups, not 12. There’s no fill line, either, so you don’t know how high you can fill it. The lid gets very warm, and even melts for some people. This generally happens on high heat or very large stove burners. The lid must be removed before pouring. This can make it awkward and unnecessarily difficult to use. Another excellent option for those on a budget, the Cuisinart Aura is about as simple as it gets. It’s made from a straight-up stainless steel and with a 2-quart capacity. It comes in different color options for your choices like silver, white, red and black. It’s simple and durable. The stainless-steel body heats up quickly, withstands most heavy use, and is very easy to clean. Did we mention how sleek it looks? The whistle is loud. Like, very loud. When your water boils, you’ll know it. The handle remains cool to the touch. You can grab it and pour without fear of burning yourself. It’s easy to clean. Just use soap and water, wipe down, and rinse. It rusts quickly. Stainless steel is supposed to avoid these problems, but the quality of the finish on this kettle isn’t enough to prevent rusting; you’ll want to ensure its empty and dry before putting it away. The coating inside peels and flakes. Like having weird stuff floating in your water? Yeah, neither do we. The plastic spout can’t handle the high heat of gas stoves. It’ll bubble and melt. 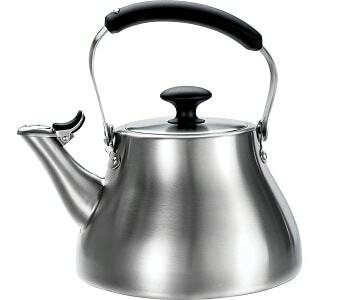 If you’re looking for something unique, this stainless-steel tea kettle from Vanika will likely fit the bill, with its classic shape and large 3.2-quart capacity. The stainless-steel finish is gorgeous. It’s shiny and reflective, good enough to stand in as a mirror. The construction is stamped, too, meaning itspretty nice stuff. The handle has a silicone grip, so it stays cool and you can easily grab it. The thumb lever does as well and can be easily reached with one hand. The whistle is loud and kind of pleasant to listen to. Some whistles are just annoying, but the unique tone of this one can be kind of fun. It come with a 100% money-back guarantee. Buy and try it out with confidence. It looks awesome. Elegant, even. We thought that was worth mentioning twice. It rusts easily, both on the lid and inside. Some people have noticed rust within just a few days of use. It has a weird smell when you first open it. The welded seams give out easily. You may find yourself taking advantage of that warranty quickly. It’s not induction-safe. It’ll work on all other stove and heating tops, however. Vremi’s 2-quart tea kettle is an easy, classic option for a tea kettle. 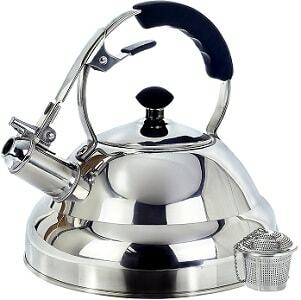 Made of stainless steel, it has a 2-quart capacity and can make up to 8 cups of tea in a single steaming pot. Get the best of both modern look and traditional feel as this tea kettle comes with dome shaped steel body with enamel or matte finish. It is available in five different color options to complement your stovetop. The nylon heat resistant handles have smooth grip that opens the spot, making it easy to pour. It is capable to hold up to 1.9 liter of water. It is best suited for electric and gas cooktops and is light enough with compact and sleek body. The stainless-steel build is durable and features an enamel coating for rust and scratch protection. It’s entirely BPA-free, too. The ergonomic handle is made of nylon and is heat-resistant. A convenient trigger opens and pours the spot with just the pull of your finger. It comes in 5 colors. Choose from red, black, blue, polished silver, or enameled white. The trigger is stiff. It can be difficult to open with a single finger, and you’ll need to squeeze hard. The handle is not very durable. It tends to break even after just a few uses. The trigger doesn’t always open when the water is hot. There’s no real explanation for this, other than that something inside the trigger must expandwith heat and prevent it from opening properly. Another very attractive tea kettle, the Chef’s Secret boasts a stainless-steel build with copper core, making it a durable, evenly-heating piece of kitchen hardware. It has well placed opening lever and heat resistant grip to keep your fingers safe and out of steams. It’s moderately-priced, too, and has the classy good looks your kitchen deserves. The copper center and stainless-steel plated exterior combine to make an even, fast-heating tea kettle. Water boils quickly on virtually any stove top. It looks great. The mirror finish is elegant and attractive, and this is a kettle you’ll enjoy keeping around your kitchen and showing off. The riveted handle is heat-resistant. Grab it off the stove without worry of being burned. The whistle is loud and clear. It’ll let you know your water is boiling, without fail. It comes with a warranty. Cheap tea kettles don’t usually have a good warranty, but this one will hold up to most things you need it for. The spout is very short, making it hard to pour effectively. It’s not very durable. It tends to break at the seams, and leak from the spout. If you’re looking for something you’ll never have to worry about, this is probably not it. 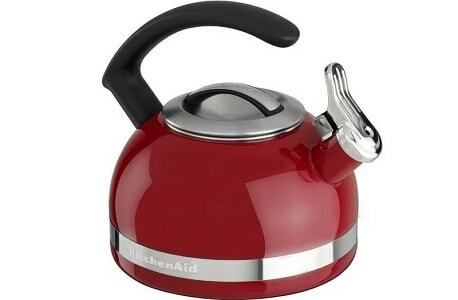 Another good compact option, the Kitchen Aid 2.0 Quart Kettle is high-quality, attractive and looks good in any kitchen. Comes with Trim Band and Emperor styled C handle for a sleek modern look, styled with bright porcelain enamel design. Its innovative design makes it heat quickly and evenly and it retains heat for longer. It has well placed opening lever and heat resistant grip to keep your fingers safe and out of steams. It has a tough, durable stainless-steel build, with a porcelain enamel exterior. It’s smooth, high-quality and built to last. It also looks great, with a stainless-steel band and Emperor-style handle. The thumb press spout is super easy to open with one hand. Just use your thumb while holding onto the handle. The C-shaped handle is sturdy, made of stainless steel. It has a rubber that keeps it from getting hot on the stove. The whistle is loud and clear. There are reports of it rusting. The hinge on the whistle/spout lid can melt over high heat. The spout is metal and gets hot on the stove. You may burn yourself when pouring, and that’s no fun. It goes without saying that a tea kettle is a very important staple for all your tea making needs. It is important for you to heat up the water and make your morning tea or coffee. It can be used any time of the day. It is very convenient and is made of durable materials. This way, you can use them for longer period. In this post, we will discuss how to use and care it. Before using it for the first time, wash the kettle inside out with soapy and warm water. 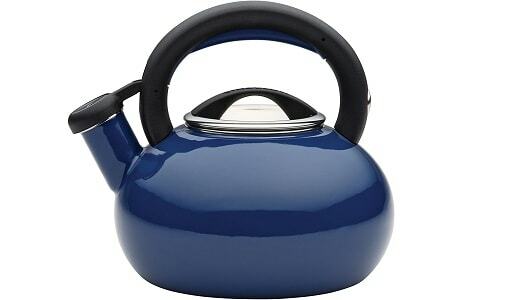 To keep your kettle looking new, use only enamel and ceramic cleaner recommended by the manufacturer. Teakettle whistle and handle may get hot. Be sure to wear oven mitts or gloves when handling tea kettle or flipping the lever open to avoid burns. Don’t leave the heated kettle alone. If you forgot, it will boil and dry out. Don’t rely only on the whistle to remind you that tea is ready. Sometimes, whistle may not work. If water has been boiled from the tea kettle dry, turn off the heat and don’t remove the tea kettle until it has been cooled down. Don’t leave a dry kettle on hot burner as it can melt the aluminum/enamel base and damage the burner and teakettle. Use a burner always on the back row of stove to keep it away from children. Use it on a burner which is smaller than kettle in diameter. It may avoid excess heat from making handle which is too hot to touch. Steam may cause burns if it is escaping out from a spout or lid. So, don’t open the lid until it cools down the water or wear oven mitt to avoid burns. Don’t fill the tea kettle overly. Overfilling it may cause boiling water to come out of the spout. Always keep the water level below the spout on the inside of the kettle. Once the water boils down, turn off the heat and let the teakettle cool for about 15 seconds before pulling/flipping open the whistle (with oven mitt) and then adding water. Point the spout off when opening spout or boiling the water. Avoid leaving the water in the kettle when it is not used. Dry the interior and remove water after use as it may build up mineral deposits or rust over time. If it accumulates mineral deposits and rust, boil water for 15 minutes on medium heat, i.e. with 1 oz. of lemon juice. Rinse the water and air dry it. Wash it only with hands. Don’t put it in dishwasher. When using tea kettle on gas stove, place it on the center of the burner directly. Pot holder should be used. If it is not placed at the center of the burner, the flames may rise up and melt the plastic whistle casing and result in burn injuries. So, it is recommended to use tea kettle only on low flame. If burner flames over the sides, it will cause discoloration of the metal. All these kettles are excellent choices for a good whistling tea kettle, and there’s an option for everybody on this list. Our favorite is still the OXO Classic Good Grips, thanks to its lightweight, durable rust-resistant build, but if there’s one you like better (maybe one that will look better in your kitchen), we think it’ll work just great. Once you’ve picked it out, do yourself a favor and learn how to brew the perfect cup of tea, and make anytime teatime. Unfortunately (or fortunately), Teaforia is no longer in business, who saw that one coming? However, if you are interested in obtaining a similar automatic tea infuser, we recommend Gourmia GTC8000W Electric Coffee & Tea Brewing System. Pricing is a fraction of the asking price for the Teaforia system and it does a great job without breaking the bank. 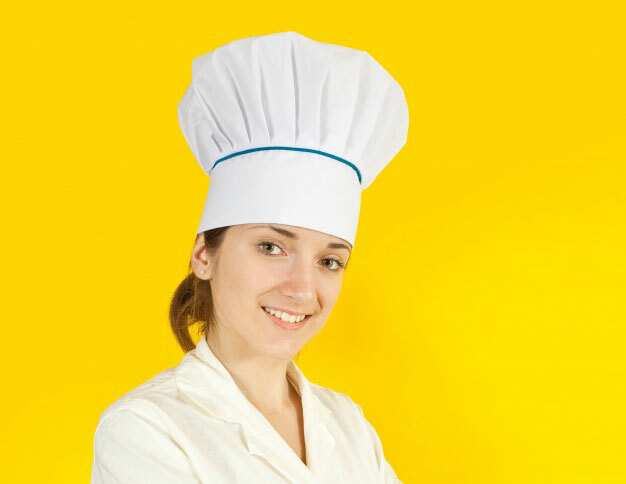 I am Samantha, former perinatologist, cook, turned full-time blogger. I specialize in reviewing the latest in cookware. 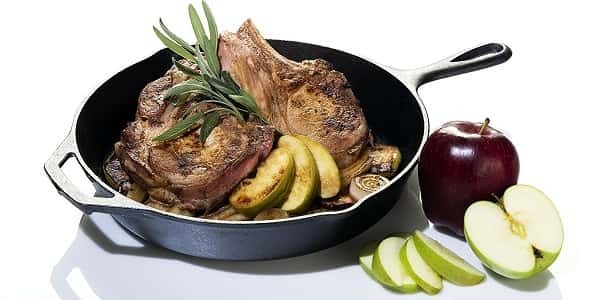 With a small team dedicated to researching appliances, cookware, and tech gadgets we bring you only the best selection to ensure you can spend your hard earned money confidently on the accessory that is best for your cooking, grilling or baking needs. With over 100 products reviewed, we are leading the way in cooking and home buyers guides. Happy Cookin’! Cookwarejunkies.com is a participant in the Amazon Services LLC Associates Program, an affiliate advertising program designed to provide a means for website owners to earn fees by linking to Amazon.com and affiliated sites, as well as to other websites that may be affiliated with Amazon Service LLC Associates Program.